Local balloon pilots have been providing education, rides, and a spectacular hot air balloon for our festival for many years. 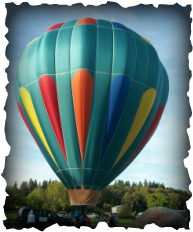 This is a chance to see a hot air balloon up close...ask questions about it...AND...if the weather is just right, our pilot will offer balloon tether rides! These rides are a favorite with lots of festival goers. There is a fee for the ride, but it's well worth it. Get a tree top view of the festival!